My husband celebrated his 60th birthday last month. Dies by Tim Holtz "Umbrella Man" and "Gearhead"
"Embellishment Strip" by Tonic Studio. 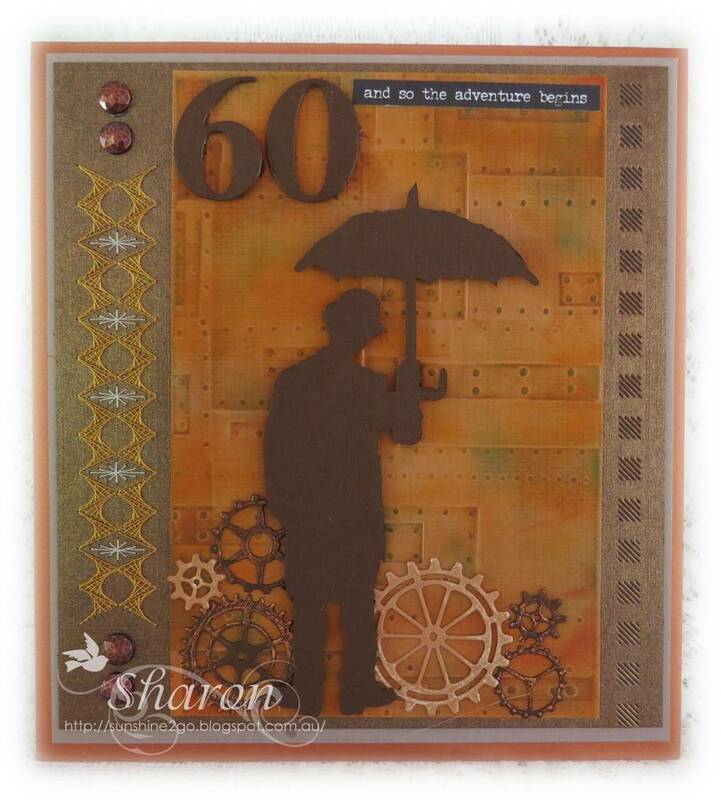 Embossing folder Sizzix 3-D Texture Fade " Foundry"
Tim Holtz Small Talk . Distress Ink - Rusty Hinge, Peacock Feathers, Wild Honey, Brushed Corduroy. Metallic Gilding wax has been added to the Cogs. Metallic gems have also been added. My friendship card for November was especially created for Petra. very small portion of the pattern. Threads are Mettler Polysheen 0182,2830, 2910. 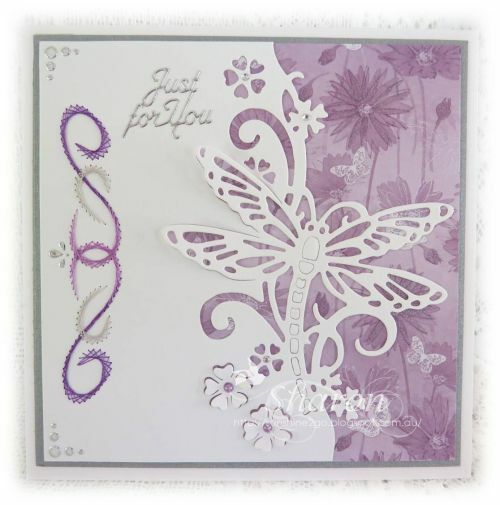 Dragonfly die by Creative Expression - Paper Cuts Collection- Dragonfly Edger. Beautiful pattern paper by Papermania " Lucy Cornwell." the paper has glitter on it. Hobbydots and pearls have also been added. whom lives in South Africa. I forgot to place a stamp on it :( amazingly it still got delivered. 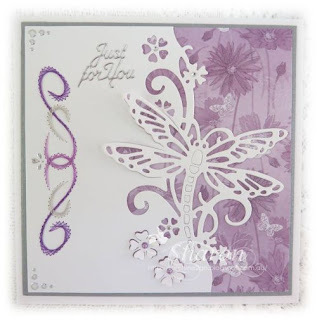 Cardmaking Online which is in Australia. 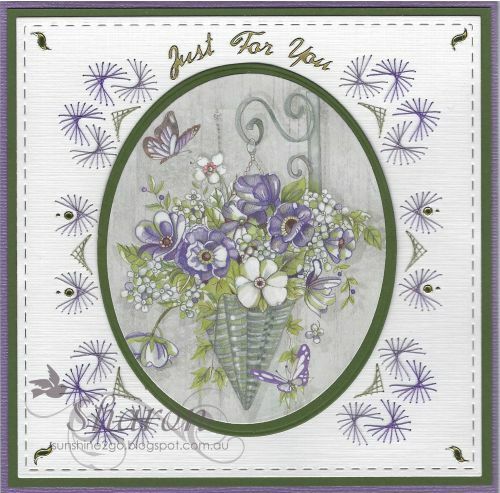 Cutting dies by Elizabeth Crafts Dotted Scallop Square 1175, Stitched Square 1118. I hope that everyone is having a wonderful weekend. We have sunshine which is lovely to see as over the past 2 weeks we have had over 300ml of rain. The pattern is by Sjaak FP-004. Image by Marianne Design "Country Flowers." 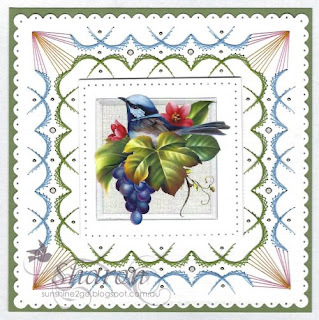 Couture Creations " Oval Nesting dies." Wink of Stella and Hobbydots have also been added. We have had a very wet week around 300mm of rain has fallen where I live.